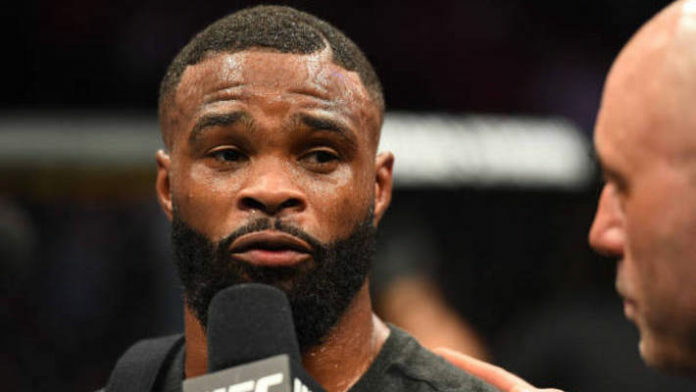 Tyron Woodley desperately wants to get back to the welterweight championship. “T-Wood” was soundly defeated by Kamaru Usman at UFC 235 last month via unanimous decision. Now, Woodley will face Robbie Lawler in a rematch from their initial meeting in 2016. He needs to topple “Ruthless” once again if he wants any hope at getting a rematch with Usman for the belt. “Now I got to do similar to what Georges St. Pierre did when he lost to Matt Hughes and had to come back and avenge that, and lost to Matt Serra and had to come back and avenge that,” Woodley said. “I thought that everything was on the up-and-up now — don’t have to struggle this much with the promotion, don’t have to struggle this much with the game plan. Had that pretty much down. Not that I got comfortable, but I thought my days of struggling was over. Woodley faces Lawler at UFC on ESPN 4 from the Target Center on June 29 in Minneapolis, Minnesota. What do you think about Woodley saying he has to do what “GSP” did?